Rimelig pris for en flott beliggenhet. Dette rommet ligger over Silver Beach på Lake Coeur d'Alene. Rommet er en kort (.5 mile) spasertur ned til Centennial Trail, Silver Beach Marina og Beach House Restaurant. Følg stien i 2 miles, og du er i hjertet av sentrum av Coeur d'Alene. Hvis du har lyst til å slappe av, drar du ned til den private bryggen hvor du kan slappe av eller ta en svømmetur. Rommet har kjøleskap, mikrobølgeovn, kaffetrakter og TV med DVD-spiller. Badet er lite og har en stall dusj. Trapp ned til rommet er bratt å navigere og kan være glatt. Vennligst ikke bestill denne eiendommen hvis du har problemer med bratte trapper eller problemer med mobilitet. Husdyr velkommen med ekstra innskudd. Viktige ting å merke seg: Det er ingen kabel-TV. Det er ingen kjøkken. Det er en A / C-enhet på rommet, men det kan bli varmt om sommeren. Wonderful little single room right outside of town. I only knocked it for the stairs going down to the cabin are a little sketchy. Every thing else was fantastic. It’s a cute little single room place to escape to without the noise of downtown. The place was clean and warm. I would stay here again. My husband and I loved our stay!! Super clean, great location, quiet and peaceful. It was not far from great shopping and restaurants. The stairs are steep so if anyone has issues navigating steep stairs, I wouldn't say here. My husband and I had no issue with them though.The cottage is tucked on the side of a hill and has a good lake view. We were able to bring our little dog and it worked perfect for us. I’ll definitely book again when we go back again. The property is easy to find and rustic. Private location but very close to downtown. As advertised. Quaint with minimal ammenities. Decent lake view. Only negatives are no closet or any place to hang clothes, and no sitting furniture other than camp-style folding chairs inside the room. Listing is open about steep stairs from road down to apartment, could use better lighting to navigate stairs at night - we had to use flashlights. 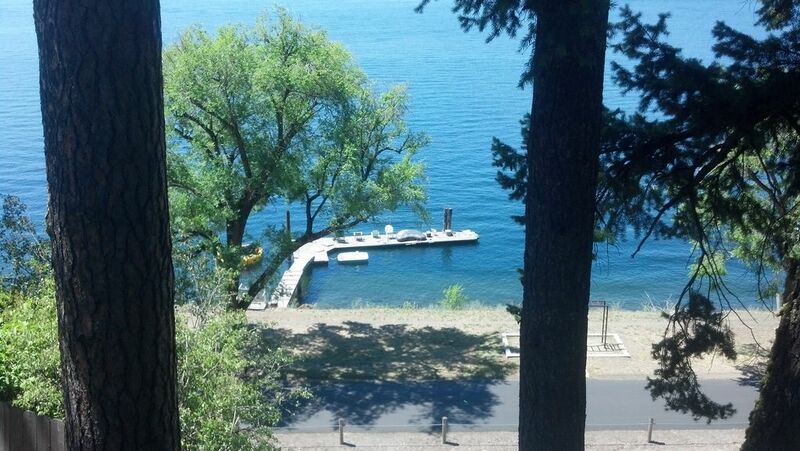 Perfect location for exploring Coeur d'Alene and surroundings. This was a wonderful location, away from the highways and quiet, but still convenient to restaurants and the downtown area. The cottage is very small and the steps down to it take some care, but it is well-equipped, comfortable, clean, and you can sit in front of the picture window and see the lake while you read or knit. It was an ideal home base for me during my week in Coeur d'Alene. Overall, the property was as advertised. Good experience.